Fall comes slowly—the temperature begins to drop ever so slightly, the days feel a bit shorter, and one leaf turning color becomes more leaves turning as the trees begin the process of a slow, beautiful death. You don’t recognize it as death at first. The return of routine after a long summer of play often feels like life. (Especially, if you’ve spent the summer entertaining small people who are FINALLY returning to school!) Petunias and geraniums are exchanged for mums, and the late harvesting begins for summer gardens, bringing a few more tomatoes and squash and perhaps those pumpkins you’ve been watching for so long. There are apples to be picked and warm cinnamon pies to be made. It really can feel like life; however, the reality is that fall is a slow, beautiful death. Growing up in the southwest I didn’t experience September bringing the start of slow, beautiful death. September simply brought more days of 100 degree plus temperatures. I long hoped to live someplace where the seasons would change. The past couple of years I have entered into the fall with a full schedule. Keeping up with my five kids, getting them back to school or settled in new cities, along with the travel my own work included left my days feeling jam packed. While I noticed the obvious changes of the season, I missed the subtle nuances around me and within me. When I am constantly running there is no time for being. When there is no time for being there is no time for listening. I will never understand the silent dying of the green pie-apple tree if I do not slow down and listen to what the Spirit is telling me…..and what all these deaths mean in light of the love of the Creator who brought them all into being; who brought me into being and you. This year the realization of what my heart has missed since our family moved to Michigan a few years ago hit me inside Hobby Lobby (I know that may seem like an odd place for revelation, but the Spirit shows up in the strangest places!). Walking past the brightly colored, bedazzled pumpkins and vibrant orange and yellow artificial leaves I realized I was having ideas and dreaming a bit about my home and the coming holidays, I realized that my heart was opened up in a space that had become tight when I was living with my schedule jam packed. I’ve noticed a pattern amongst the women I read in the blogosphere and those with full schedules of work and ministry, myself included. Words are being put to their lives like exhaustion, burned out, lost myself, living under too much pressure, not sure what I am doing or why I am doing it. It happens slowly, adding just one more thing, taking one more speaking engagement or conference, an extra client or project, teaching Sunday school at church….it goes on and on. Slowly you lose awareness of the world around you and of yourself, and you don’t even realize it is happening. It was the dead of winter last year when I found myself holding the reality of how icy it felt in my soul and how distanced I was from the life I wanted to be living. As spring came to Michigan it also came for my soul, gently thawing out what had become frozen. This month I am entering the slow, beautiful death more alive to the nuances of my world. The first twinges of yellow, orange and red on the trees, the quieter mornings because fewer crickets are in my yard, my little girls and their funny expressions, the absence of my children away at college. I am feeling the loss of things I’ve said “no” to for now, the death of “what I thought would happen” in some places. I am noticing and listening. There is aching and sadness alongside beauty and gratitude. It is the beginning of the slow, beautiful death and I plan on being present in my life to notice, wonder and listen as it unfolds. Beautiful…I love being a part of your unfolding. 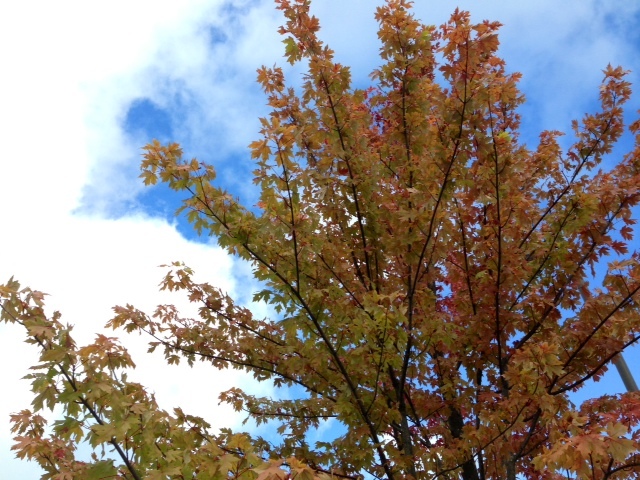 This entry causes me to notice and to enjoy the changes around me…thank you for adding some spice into this fall day! Thank you Mary Jane, it is good to have friends close by for all the nuances of life! Thanks Anna. I have many memories over cups of coffee listening to your “noticings and wonderings”…miss you!